Rach totally adores this ribbon released for the EDM competition as she had a hand in designing it and naming it after her daughter. Jennifer from Strano also sent her all the offcuts of the ribbons used for the magazine onsert so with so many short pieces Rach set to work on making this layout. It uses a simple design that lets the beautiful colour of the ribbon show, and matched it with a series of photos of her taking photos. When Marni found out she was moving to Mackay her only condition was that she had her own scrapping space. Well it turned out that there was not enough rooms in the house but she did get part of the garage and after some hard work it has become the envy of all her friends. 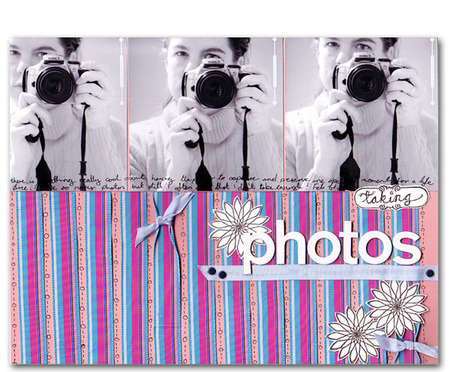 For this layout Marni used Strano Designs ribbon to create a photo mat. The ribbon is nice and wide so it did not take much effort. 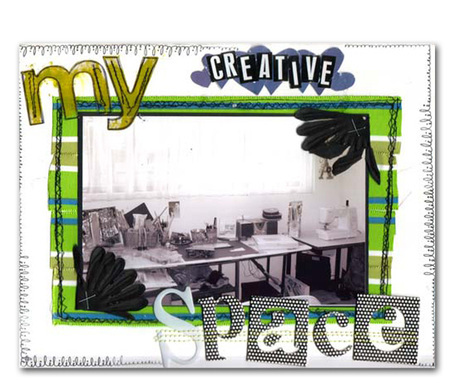 As the ribbon was so bright and colourful Marni did not want to add much colour to the rest of her layout so she used black to tone it down a little. Black Heidi Swapp letter stickers, stitching, Lil Davis chipboard letters, Junkitz flowers and Basic Grey rub ons all help to ground the layout. This layout is about Caz’s husband and the group of mates that he goes fishing with. 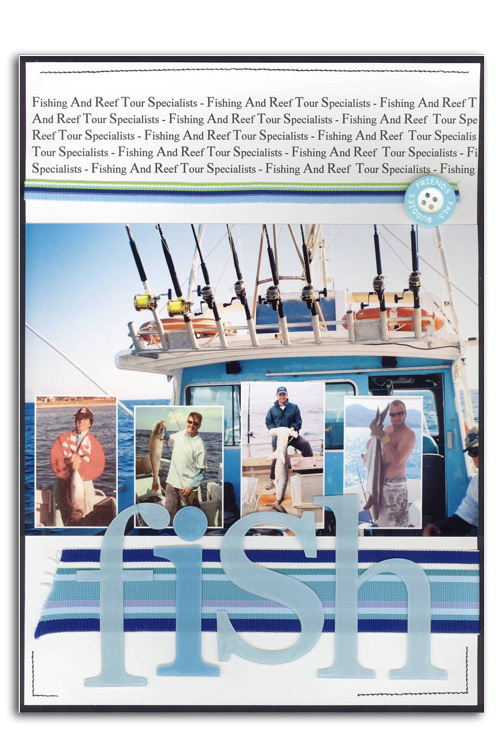 Every couple of years they plan a week away to a different destination and fish to their hearts content. No nagging wives, no annoying kids, and sometimes no fish...! To keep it manly embellishments were kept to a minimum. 2 different sized Strano ribbons echo the beautiful blues in the sky and ocean. The heading is made from Heidi Grace Individual Monogram Letters and the junkitz button says Friends-Buddies-Pals. 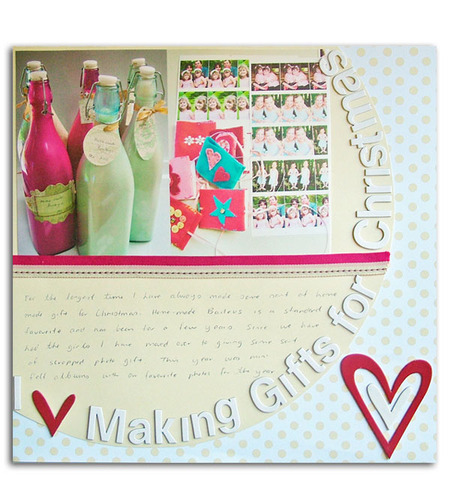 One of the things Tamar loves most about being creative is the chance to share that with others - she loves making gifts for Christmas and now that she is a scrapbooker she just does photo style gifts as well. These photos are a few of the gifts Tamar made this year and before she wrapped them she snapped theses shots - one way to remember what Tamar made in 2006. Tamar chose a neutral background with the Lil Davis papers and added plenty of chipboard for good measure - she loves the heidi swapp letters - and the chance to put that great big title onto one layout. 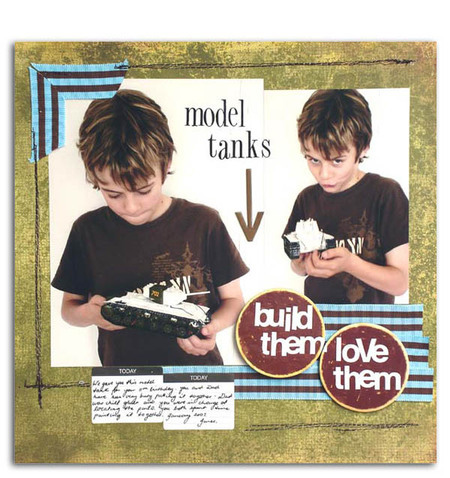 Mel's son James enjoys building and painting model tanks in his spare time, so this was a perfect layout opportunity for Mel. The Basic Grey fruitcake (vintage ornaments/pine) patterned paper she chose gave a good boyish feel to the page and using some Strano ribbon to create a large photo corner helped to balance the layout well.